Microblading has become the most sought after facial procedure in decades. The field of Permanent Makeup or Intradermal Cosmetics has never seen anything like this to date. This procedure, unlike the old stenciled brows of the past, creates a softer more natural hair stroke look to brow enhancement. Is it a tattoo one might ask? Yes, anytime pigments are inserted under the skin to stay for a lengthy amount of time, it is a form of cosmetic tattoo. Microblading is not done with a tattoo machine like traditional permanent makeup but with hand tools nor is it deposited as deeply into the skin thus being considered semi-permanent. Microblade artists are popping up everywhere unlike never before. Training seminars are coming in from several countries and there are countless going on in every city in every state monthly. Nonetheless, choose your technician wisely! Do not choose by price or you will get what you pay for. Be sure you are offered a consultation where you will have the opportunity to peruse the artist’s gallery of pictures, studio presentation and ask all the questions you can until you feel comfortable with your decision. Veteran technicians are often more conservative and have more experience with skin, pigment and handling the needs of a varied clientele. During the consultation, you should be able to discuss the shape, choose the best color, discuss the procedure process, go over the aftercare and go over pretreatment advice and any health issues. State approved paperwork should be given and completed before the actual procedure date and gone over together to insure you have an understanding of the informed consent. Photos should be taken without any makeup in good lighting so the before and after photos are on record. It is amazing to see the transformation from your sparse brows to a polished natural Microbladed brow look! 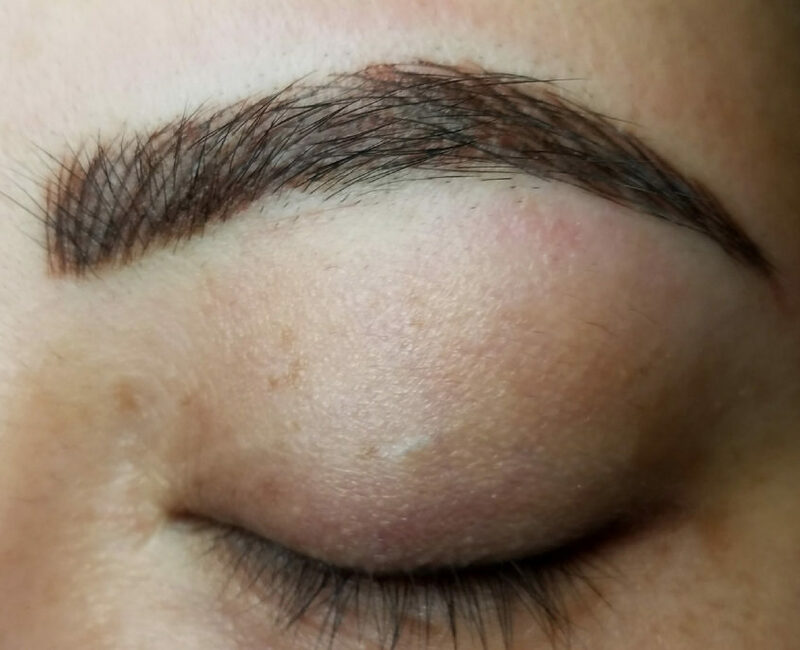 Microblading has some pretreatment advice to heed prior to your procedure. It is imperative that you follow it to have nothing inhibiting the process. Failure to do so will yield less of a result in the initial procedure. You will be given enough time after the consultation to be able to follow the advice given. I advise not doing consultation and procedure the same day in the event that you need to work through some of this pretreatment list. If you have nothing of concern, same day consultation and procedure is fine. The procedure typically with numbing and photos and aftercare explanation and demonstration takes about 2 hours. I allow plenty of time to be sure of your comfort and expected input. Microblading is done with a non -electrical hand tool and sterile disposable blades. The Microblade is a series of small needles wrapped together to form the blade but is NOT like a typical blade or scalpel. It is tiny and precise and in skilled experienced hands does beautiful work. Numbing agents will be added additionally during the procedure for additional comfort. After the procedure your aftercare is carefully explained. Post procedure photos are then taken and you are done for 6 weeks at which time you will have your included touch up. It is a requirement to achieve the best result that will last the longest. Color can fade significantly after as the skin heals over and without a touchup in the time agreed upon, irregularities and unevenness will be evident. Waiting over the recommended 6 weeks will result in more fading and more work for the technician and another fee for you. Unforeseen circumstances are understandable and considered. During the Microblade post care time, you will love your brows the day they are done. The next couple of days you will probably question the color as it appears darker than it will end up being. Remember the color we selected and do not be concerned. They are normally presentable for any outing or work with just a sparing amount of aftercare ointment on them. You are limited to only a few things like activities that cause you to sweat, sun exposure, swimming etc. All of which are explained to you in detail. As the first few days pass you will find them shedding or lightly flaking. This is a normal part of the healing process. Once the brows shed after about 7-9 days, the color will appear very light and soft. It will take a couple of weeks for the maturation process under the skin and at that time we will have the initial result and know what needs to be completed in the touch up session. If you experience any spaces or gaps you are welcome to use your cosmetic pencils or powder until touch up time. You will however have a brow to guide you and very little to add until completed. Microblading is available for almost everyone over 18. Men as well as women are enjoying its many benefits. As with any facial tattoo work, there is upkeep every 12- 24 months to keep them looking beautiful and rejuvenated. The at home care will determine the length of time they last. Join in the phenomenon and schedule your consultation today for the art of Microblading your brows. I am happy to welcome you into my quaint Allen studio and provide you with the answers and information you desire to make your decision possible.